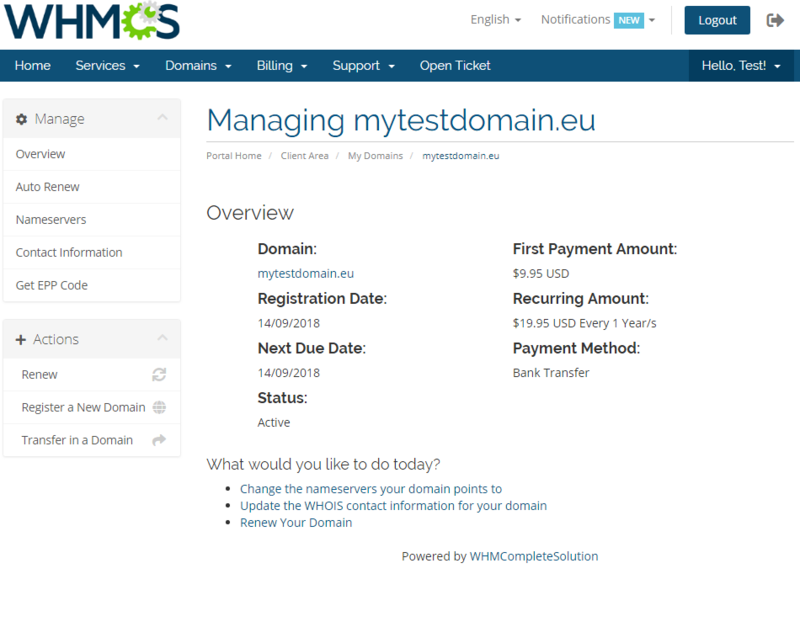 EURid Registrar For WHMCS is a domain registrar module that introduces automated provisioning and management of .eu domains in WHMCS. The module will let your clients manage domains straight in your client area as well. This tutorial will show you how to successfully install EURid Registrar For WHMCS. 4. When you install EURid Registrar For WHMCS for the first time you have to rename 'license_RENAME.php' file. File is located in 'modules/registrars/eurid/license_RENAME.php'. Rename it from 'license_RENAME.php' to 'license.php'. Log in to your WHMCS admin area. Go to 'Setup' → 'Products/Services' → 'Domain Registrars'. Afterwards, find 'EURid' and press 'Activate' button. 7. In the next step you need to set up access to EURid API. 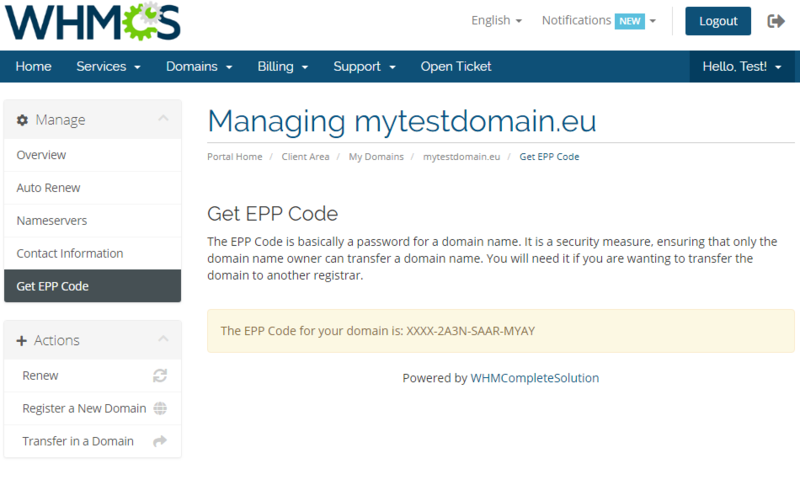 To do so, fill in 'EPP Username' and 'EPP Password' fields with your EURid access details. Additionally, you have to fill out the 'Server', 'Billing Contact ID' and 'Tech Contact ID' fields. Next, confirm through pressing 'Save' button. Search by contact type 'Billing' and 'Tech', press 'Search' button. Then copy values from the 'Alias' field. 8. 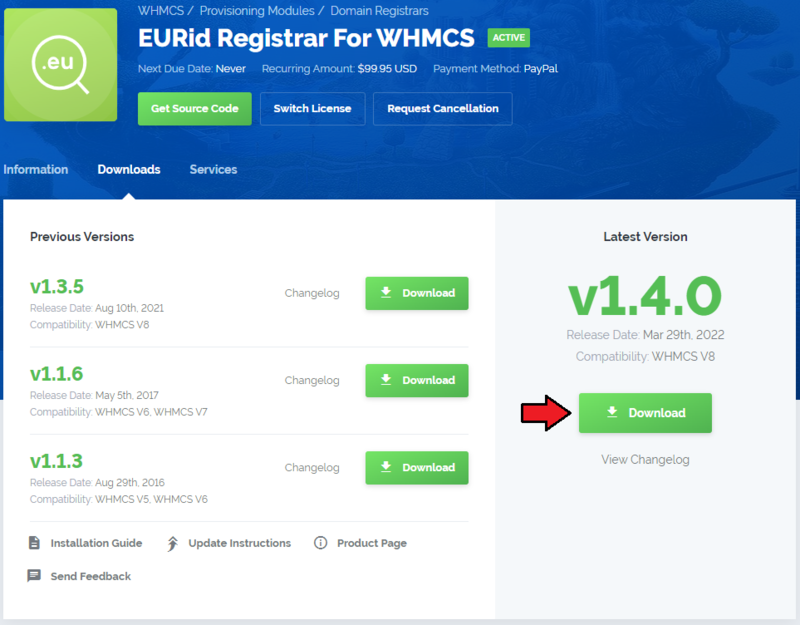 You have just successfully installed EURid Registrar For WHMCS! 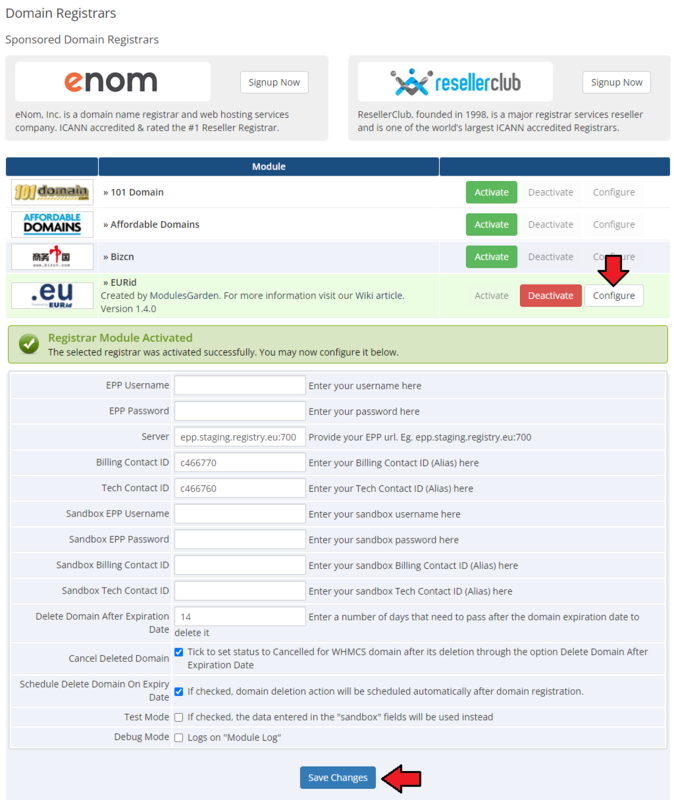 EURid Registrar For WHMCS allows you to sell TLDs from EURid via WHMCS system. 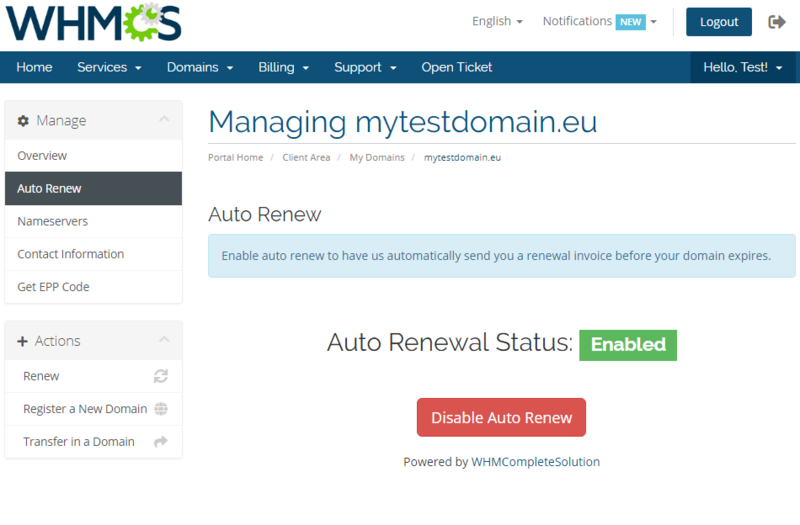 Additionally, EURid Registrar For WHMCS allows your customers to manage their domains from the WHMCS client area. 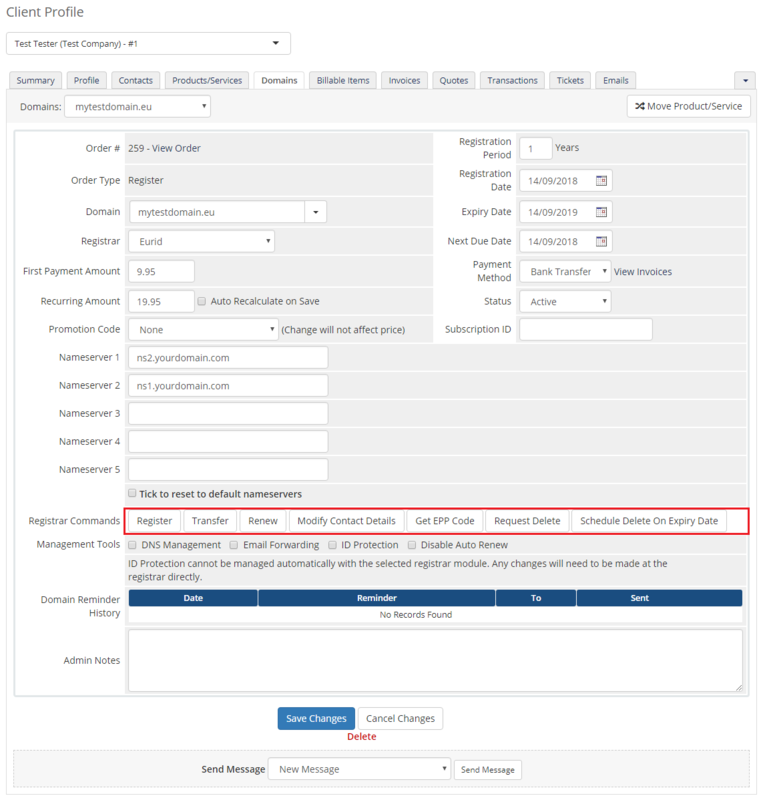 Begin your work with the registrar by assuring that the .eu TLD exists in your WHMCS and Eurid registrar has been assigned to it. Proceed to 'Setup' → 'Products/Services' → 'Domain Pricing'. Enter your TLD and choose 'Eurid' from the 'Auto Registration' dropdown menu as shown on the screen below. Decide whether to offer your customers access to 'Request EPP Code' feature. Then press 'Save Changes' button. Move to the 'Open Pricing' section and set up the pricing for the domain TLD. In a newly opened window you can set up your prices. Remember to save the changes! This is it! 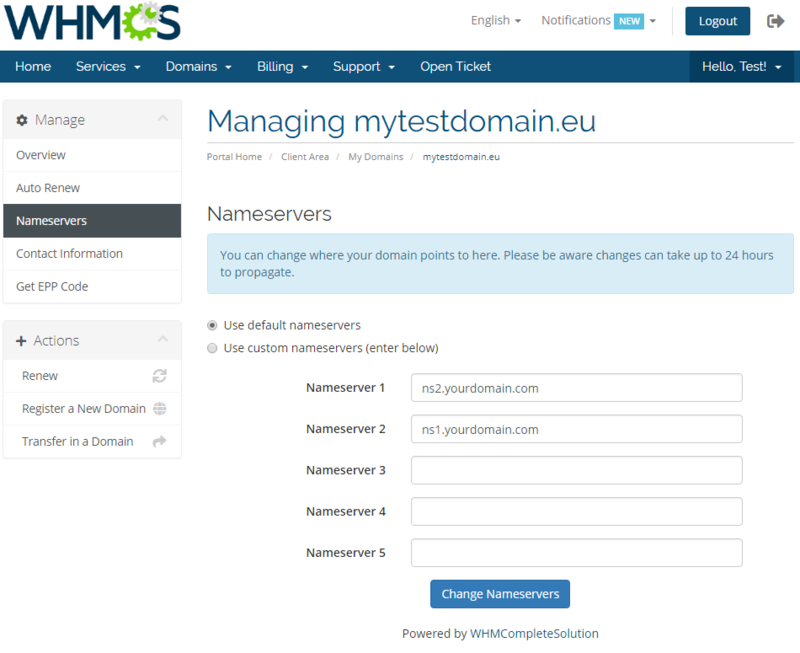 From now on your customers can start ordering '.eu' domains directly in your WHMCS. The process of ordering an EURid domain goes alike ordering any other domain. 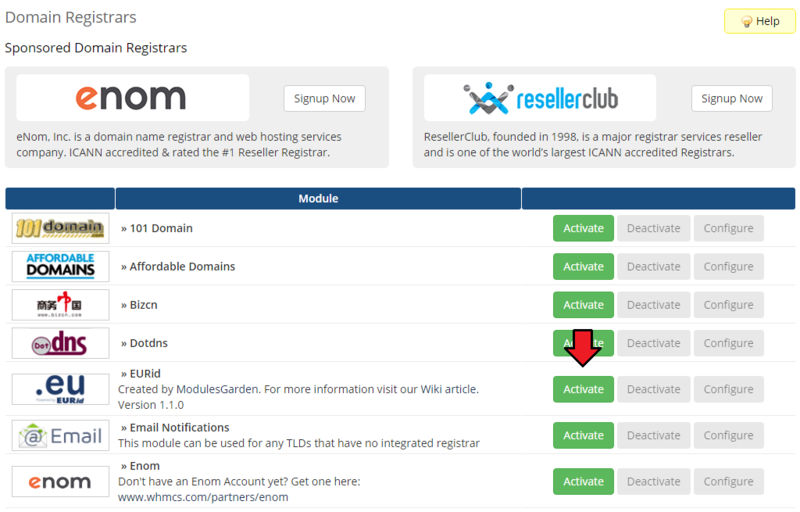 Simply search whether the domain is available, add to cart, add nameservers if you need and complete the order. 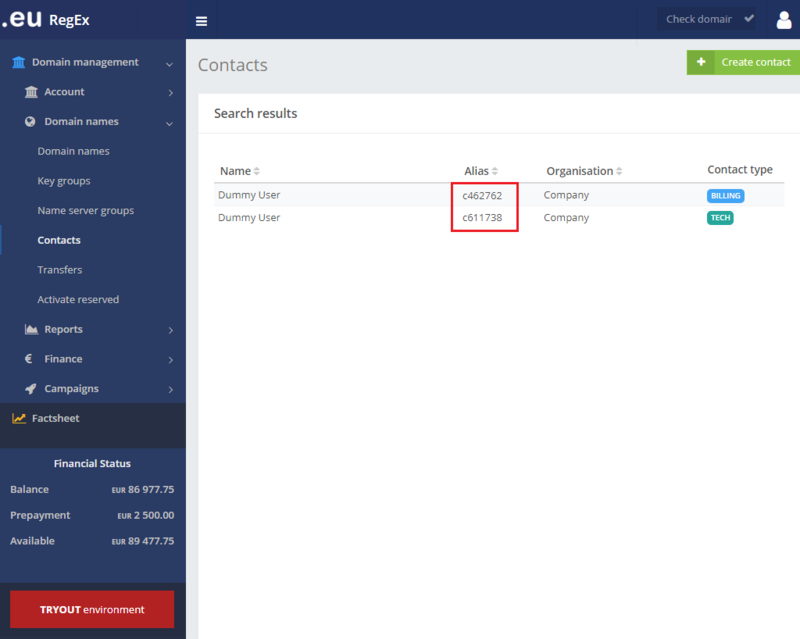 Along with basic actions like 'Register', 'Renew' and 'Transfer', you are allowed to use the 'Modify Contact Details', 'Request Delete' and 'Get EPP Code' features. You can also disable/enable auto renewal through marking/unmarking the corresponding to this option checkbox. Confirm changes through clicking on 'Save Changes' button. 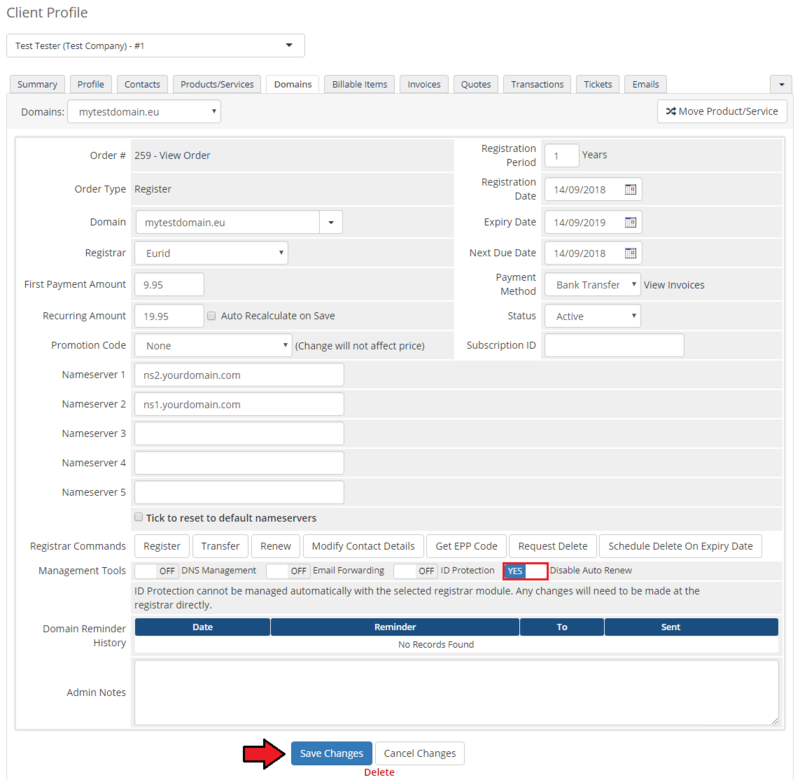 Your customers can order various actions on their EURid Registrar domain in the client area. View basic information related to the domain. At 'Auto Renew' tab clients can enable/disable auto renewal by pressing 'Enable Auto Renew'/'Disable Auto Renew' button. 'Nameservers' tab allows clients to change nameservers used by their domain. 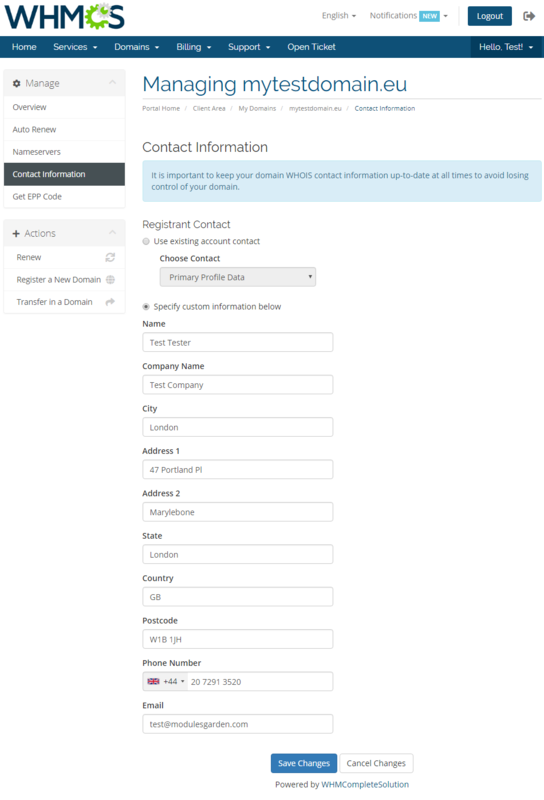 Under 'Manage' → 'Contact Information' your clients can also view and modify the registrant contact information. Note: Billing and Tech contacts' details may be edited in the admin area only. The two contacts details should be always the same. Request EPP Code for your domain by pressing 'Get EPP Code'. 1. As soon as a domain expires, its status in WHMCS system is synchronized. 2. Transfer synchronization changes domain status to active right after the domain transfer status on EURid server is set to pending. 3. You are able to enter an IP address in to the nameserver field. Note: Please do not use a colon ':' sign between 'ns1.somedomain.eu' and an IP address. Just leave a 'space' in between. 4. The actions on domains: status synchronization, transfer and delete x days after expiration are performed with the main WHMCS cron task. 2. If your firewall is enabled, you need to add your WHMCS server IP address at your EURid panel. 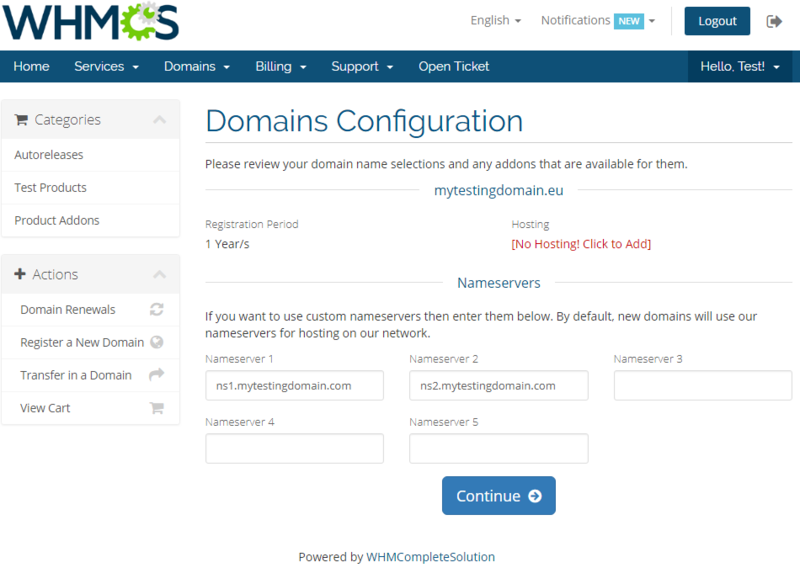 Go to the 'Domain Management' → 'IP Addresses' and add IP address into table 'Allowed IP addresses for Registrar WHOIS'. Additionally, open up a port 43 in your WHMCS server firewall and restart it. 3. 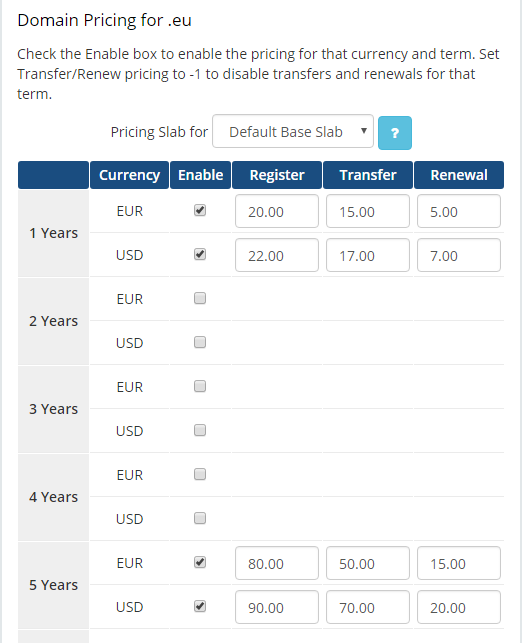 If one of the TLDs you have configured is unavailable, please make sure you have set up the pricing in a default currency. 4. If lookup of any .eu domain returns 'Sorry, your_domain.eu is already taken', you need to modify the 'whois.json' file located in '/resources/domains/whois.json'. Read more in the WHMCS official documentation. This page has been accessed 43,313 times.